The fifth entry in J.K. Rowling’s Harry Potter fantasy series adapted to film, Harry Potter and The Order of the Phoenix, directed by David Yates and written for the screen by Michael Goldenberg (Green Lantern, Peter Pan) is where the franchise began its darker turn. This is a timely transition given its protagonist, the titular boy wizard Harry Potter (Daniel Radcliffe) and his friends Ron (Rupert Grint) and Hermione (Emma Watson, Beauty and the Beast), and the actors portraying them could hardly pass for little kids by this point. Following on from the events in The Goblet of Fire, Harry finds himself in a Wizarding world where hardly anyone believes him that the nefarious Lord Voldemort (Ralph Fiennes) has returned. Harry and his strongest ally, the headmaster of the wizarding school Hogwarts, Albus Dumbledore (Michael Gambon) are target both by those afraid to admit that “he who shall not be named” may actually be back and those who are not so secretly loyal to the dark lord himself. With Dumbledore in a precarious position as headmaster and the authoritarian Dolores Umbridge (Imelda Staunton) all but declaring all-out war on anyone loyal to Dumbledore and who may be a ‘mugblood’ (a derogatory term for a person descended from someone with no magical ability), Harry has no choice but to secretly train his friends, “Dumbledore’s Army,” to defend themselves against Voldemort and the Death Eaters (a group of wizards and witches loyal to Lord Voldemort who seek to eliminate all Muggle-Borns) who have begun to openly attack. Director David Yates takes the franchise to whole new level of maturity, bringing Harry and co. to a new, complex level of angst, insecurity, and doubt, while combining the genres of B-horror, sci-fi and fantasy on the screen from Rowling’s source. It would be impossible to make the book scene-for-scene, line-for-line, but in Yate’s world of looming darkness, authoritarian regimes, and teenage insecurities manifested in the outpouring of pubescent rebellion, we don’t need every scene from the page to get the gist of this fabulously dark yet accessible coming of age tale. And visually, The Order of the Phoenix, like all the Harry Potter films, is stunning. 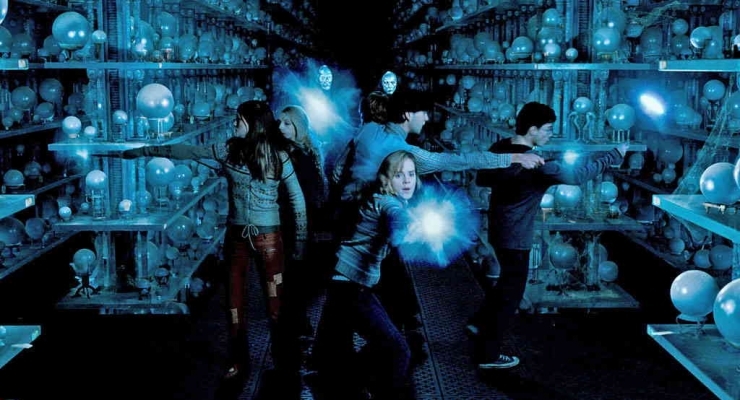 While the films have always broken down slightly during the wand battles and gotten confusing since all of those spell blasts look the same, they have still always managed to use the glowing and casting to good effect. Just look at how the young wizards walk through The Department of Mysteries is pitch-black, wands aglow. Then there are the other CGI effects that make the world come alive, like the various creatures. The Order of the Phoenix sets the tone for the finale of the Harry Potter series and does it well. The wizarding war begins as Harry Potter, Hermione, and Ron mature, and the franchise matures along with them. 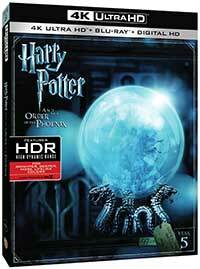 Harry Potter and The Order of the Phoenix was originally shot on 35mm film stock and now comes to this 4K Ultra HD Blu-ray in an HEVC encoded restoration with HDR10 High Dynamic Range (HDR). Let me get this out of the way – This Harry Potter film (and the others – reviews to come shortly) are the best Ultra HD restorations of catalogue titles I have seen so far, hands down, bar none. Period. And that includes the fantastic new DTS:X audio mixes (see below). So far, I have seen some that I thought looked absolutely stunning during the night sequences (Crouching Tiger, Hidden Dragon), some that were a mixed bag due to their original source (the original Jason Bourne trilogy), and some that looked excellent visually, but didn’t supply the sort of visual effects that really allow for HDR to standout much and didn’t have the soundtrack to use as reference material (Goodfellas). The closest that has come to being an all-around stunning Ultra HD catalogue release so far has been Underworld, but Harry Potter tops that. The application of the HDR is breathtaking. Right from the opening scene of The Order of the Phoenix on can tell it’s special with the brightness that nearly hurts the eyes like a truly bright day. It doesn’t stop there. In The Department of Mysteries, the contrast between darkness and the brightness of orbs of memories is stunning and when the battle there begins, it gets even more fantastic. The Order of the Phoenix get an all-new DTS:X remix for this Ultra HD release from Warner Bros. and boy, oh, boy, is it an awesome one. Harry Potter is perhaps ready-made for being a Home Theater showpiece, but here the sound mixers have really done the film justice and utilized the new object-oriented format to the best of its abilities. Those ‘X’ channels as I like to call them aren’t just there to add another logo to the packaging. In this mix, they really add more dimensions to the sound and bring more channels filled with solid, discrete effects. The other channels don’t get left out either, so when the Death Eaters start whipping around and the wands start shooting out spells, sounds emanate from everywhere – behind, the sides, up above. And the low-end is beefy without being overwhelming or boomy. Add this one to your list of reference audio releases somewhere near the top if not THE top. While the set is packed with bonus materials on a bonus Blu-ray Disc, there’s nothing we haven’t seen before on previous releases. Creating the World of Harry Potter Part 5: Evolution (1.78:1; 1080i/60; 00:57:16) – Production design, costumes, filmmaking style, even the look of Hogwarts itself, have all developed from film to film over time. Discover how these elements have evolved, and what new concepts have been introduced as the movies progress. Harry Potter and The Order of the Phoenix: Behind the Magic (1.78:1; 1080i/60; 00:46:46) – A behind the scenes look at the production of The Order of the Phoenix. Building the Magic: The Sets of Harry Potter (1.78:1; 1080i/60; 00:20:22) – Have a behind the scenes look at how the sets of Harry Potter come together. Harry Potter: The Magic of Editing (1.78:1; 1080i/60; 00:05:21) — Director David Yates and editor mark Day show us what a difference a good edit makes and allow you to edit a scene. It seems strange that Warner Bros. released the last four films in the Harry Potter series on Ultra HD first, but that aside, this film looks and sounds stunning. If you have upgraded to 4K, have a HDR equipped display and a DTS:X (DTS-HD Master Audio 7.1) capable sound system, then this is a must. Adding depth, maturity, and complexity along with its stunning visual effects, Harry Potter and The Order of the Phoenix is the film where this beloved franchise began to grow up. This new 4K Ultra HD Blu-ray from Warner Bros. also instantly becomes one of the best catalogue releases on the still-new format. Filed Under: 4K Ultra HD Blu-ray, Action, Adventure, BD & UHD BD, Fantasy, Warner Home Video Tagged With: Action, Adventure, Daniel Radcliffe, Emma Watson, Fantasy, Harry Potter, J.K. Rowling, Rupert Grint, The Order of the Phoenix, Warner Bros.